Hearing about my nephew Ethan’s first job bought a flood of memories back to me about my first job. Ethan is working at a salubrious place by the name of Bucking Beef. In other words, it's a roast and grill carvery. A roast and grill carvery where they make the new staff wear a badge which says, “Sorry if I buck up, I’m new”. I don’t even think there were many fast food restaurants in the country town I lived when I first started working. I was a very naive 15 years old when my father got me a part-time job with Boris, a German wedding caterer. His business was called Boris Backer Wedding Caterer (not to be confused with Boris Becker, Tennis Player). Boris was also the Executive Chef. And the first alcoholic I had ever met. He taught me a lot about food. And as it transpired, way too much about questionable food practices. Boris used to drink a lot of wine while he cooked and he grew progressively drunker and louder over the course of the evening (I subsequently picked up the habit of having a glass of wine while cooking except I don’t drink straight out of the bottle and then pour the same wine into the food I am preparing). I also learnt that waitressing is an art form all on its own and that you have to have the skills of both a contortionist and a diplomat to survive what's thrown at you by the kitchen and the public night after night. In my first week I found out that carrying 10 plates at a time was beyond my limits and is guaranteed to result in a pile of broken crockery and a very angry boss. I also learnt that wedding celebrations weren't always the stuff of fairy tales and that when great quantities of alcohol are consumed you have to expect the unexpected from those you least expect it from. Usually, as it happened, the unexpected came from the parents of the Bride or Groom. And, in these circumstances, I learnt the importance of keeping my mouth shut and maintaining a fixed smile. I did, however, gain a life long appreciation for anyone who works in the restaurant industry and I was also fortunate to gain the most fantastic recipe for Black Forest Cake which I have been making on the odd occasion, ever since. And funnily enough, I think of Boris each and every time I make it. What about you, what was your first job and how old were you? Black Forest was my all time fav... until I tried a torte a couple of months back. One of my first jobs was being a waitress in an restaurant that was open 24 hours. And I had the night shift.... It was fun enough, I learned a lot, but not good for a young marriage. So I quit after a year. But like you, I have an appreciation for all restaurant workers. My first job was right after college as a sales engineer (an engineer that sells). I was 23. Then, I couldn't afford a black forest. It was the food of the rich. I was 16 years old when I started my first proper job - a sales assistant in a furniture shop in Aberdeen. It was hell - although I did manage to sell a leather suite for £1,000. Which was a lot of money in 1978! Hey thanks for the vocabulary boost. 'salubrious' - I had to look that one up which is a healthy thing. "think of Boris" making the cake - does that mean you put wine in the cake? There was a great Aussie related story in today Chicago Tribune. I'll be sending it your way. In some ways Boris was the bearer of Too Much Information...lol, and yet...Maybe not. My first real job was as an Apprentice in a Summer Stock Company. None of us got paid and we worked like slaves--sometimes 'round the clock---And LOVED Every Minute of it...Truly. I love black forest cake...you must post the recipe! Great story Lily! I wonder what happened to Boris. What a funny post today! Smiling from ear to ear right now ... my first job? Not sure I can even remember it's been so long ago, but it may have been for a private 'eye' in E. St. Louis, Illinois which is really not even a city an more .. kind of a burned out shell of a city sitting across the river from St. Louis, Missouri. The guy had a gun and holster and a sidekick. I can't even imagine what they hired me to do. I ended up playing tennis for hours on end with the sidekick! I was young .. what did I know? I worked there for a year and then went off to work in an 'indoor' rest as a waitress. My first "real" job was after my first year of college as a maid at a hotel. I certainly came to appreciate the people who had to do it as a permanent, full time job. I never knew in what condition I would find the room upon entering; always dreaded the possibilty of finding one that someone had partied in. After that summer, I have always tidied up the hotel room I have stayed in and never leave trash or papers on the table or floor. I also leave a tip with a little note that says, "Thank you for the maid service." for the person who has to clean up after me. That was certainly something that meant a lot to me even if it was only $1 (back in 1975) because I knew someone had thought about the (dirty) work I was doing. Boris reminds me of the chef who got drunk on Gourmet Night at Fawlty Towers. I don't know about the beef, but that Black Forest cake looks totally amazing!!! It just couldn't taste as incredible as it looks. Wow! You learned a few invaluable lessons at your first job! My first job was market reserach, going door-to-door and taking political survey and other polls. It was pretty fun actually, but the questions were slanted to get the answers that the particular company wanted to get. I've noticed that that practice continues, such as asking the prospective homebuyer if they want 10 or 15 or 20 foot deep back yards. How about an option for a half-acre?!? a little blogging, some cake, more cake, who's blogging I'm too busy with the cake. Zero calories in blogging. Really your brain will burn some finding all that wit inside your head. Please check out my latest blog idea (do Aussie say throw it on the wall and see if it sticks?) which is called 'I can't blog'. You were part of the inspiration - just kidding go eat some cake lighten up already. 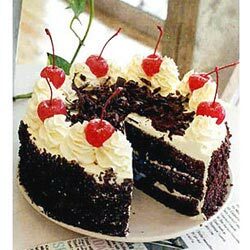 This Black Forest cake seems to be yummy i wish i could eat it rite now. Yummm... recipe share? Oh, scratch that. I'm trying to eat healthy and if I took a bite of that horribly (have to say that) delicious looking cake, I'd have to double or triple my workout time. Heck, just looking at the cake makes me feel like I gained 5 pounds. Hehe. First job is the same industry I'm in now. Only, I started working in the finance industry at the age of 12 when I first learned to type. My resume is nothing but.. ah well. Greg worked in the restaurant industry for a good 20 years. He still has dreams about working in a restaurant, very often he dreams about it, in fact! How funny. What do Aussies call an irritating commenter? Hopefully not Lisleman. It's the dead of winter you don't have Christmas during your winter so why don't you plan a visit to A Few Clowns Short? I've annoyed a blogger in SF too much already. One blogger in Malaysia stopped blogging. Maybe it was me. How do you say 'kiss off' in strine? You could stop by and tell me. One of my first jobs was delivering Christmas mail. I loved it At first I chose a very affluent area expecting to rake in the tips -but I didn't. My brother told me that I had got it wrong and to deliver to the workers. I did and it was O. K. there. One man actually gave me 2 shillings - a fortune then !.